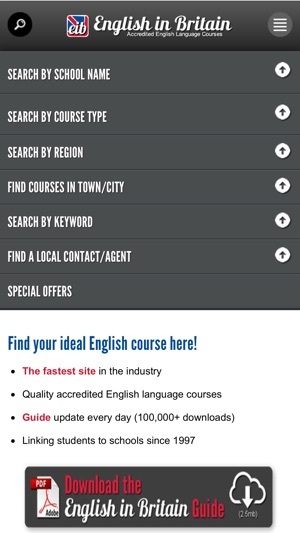 Find your ideal English language course here! 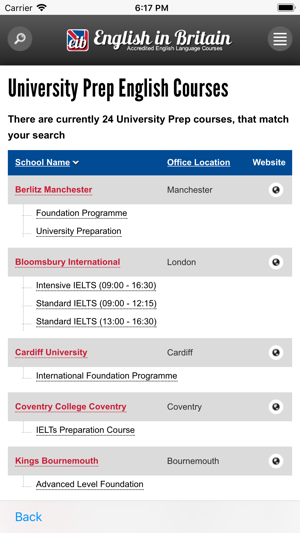 English in Britain includes only fully accredited English courses in schools, colleges and universities in the United Kingdom. 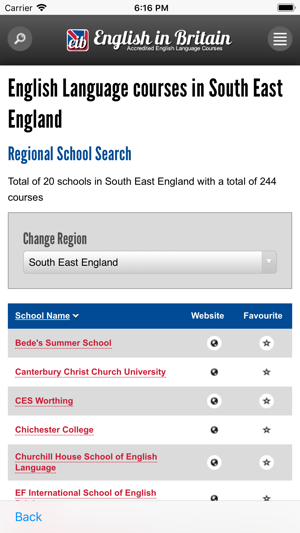 Search by course type, by school name, by region, by city, by keyword, and get the results you want. 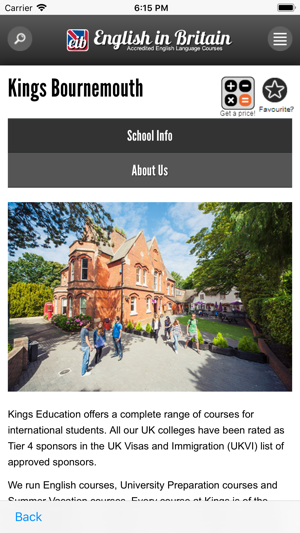 Save the schools and courses that interest you, visit the websites, send enquiries, check the location - right through to street view on Google maps. English in Britain has the information, the searches and the links you need to find the best course for you. It's free, it's fast and it's fit! English in Britain is long established. Course data was originally published in 1989 on disk before being ported to the website in 1997 - a remarkable 30 year life so far. 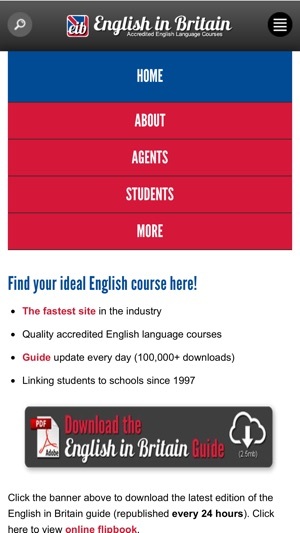 The service consists of the website at EnglishinBritain.co.uk, the downloadable PDF guide which is updated automatically every 24 hours, the gallery where schools can post as many pictures or videos as they wish, and now the app. The app not only means that this valuable source of English language course information can reside on your mobile device, it also enables "push notifications" so that updates and news can be sent to you any time (if you wish). There's no advertising, just powerful searches, high quality information and links. دورات اللغة الإنجليزية, Cours d'anglais, Englisch Sprachkurse, cursos de inglés, corsi di inglese, Cursos de Inglês, kursów języka angielskiego, İngilizce dil kursları, Курсы английского языка.